Pioneers of denim and change, Diesel present number plaque denim jacket that isperfect for everyday wear. Crafted blue cotton, it features classic collar, a front button fastening, a front flap pocket, a silver-tone logo plaque, a front zip pocket, long sleeves and button cuffs. Double dare you to go double-denim? It's a classic look which you just can't beat: women's denim jackets are effortlessly cool. 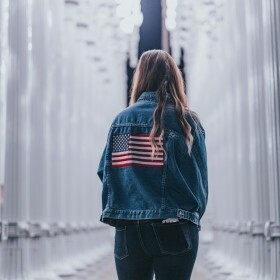 From your all-star denim brands like Diesel and Tommy Hilfiger to trendy alternative styles like a white denim jacket we've got it all on Fashiola so we know you'll be able to find your brand new jacket right here! If you think the double-denim look is outdated? Think again as you will find a whole host of colorful denim co-ord from mini skirts to skinny jeans. This year it's time to embrace the throwback trend - and if you're still not sure about it, always start with black.